November 2011 will go down in my personal history books (you know, my blog) as being one of the best months ever. Normally November gets a 3 or 4 star rating from me anyway because my birthday fell on the 22nd and Thanksgiving and all its trimmings came along right after. So why is this particular November getting the full 5 star rating? Because of my birthday challenge and The Happy Day Project. Practicing random and more intentional acts of kindness has been such a blessing to me (and my family) along with blessing others with happy little surprises here and there. Almost every day I'd think about what I (or we) could do for someone and then look forward to carrying that task out. If I didn't *do* an act of kindness for a few days, I realized I was crabby. I bet doing something for someone else would have zapped that crabappleness right out of me in a jiffy! 14. 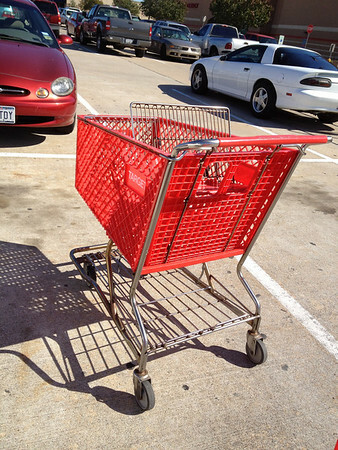 Returned two stray shopping carts to the corrals along with my own at Target. 15. 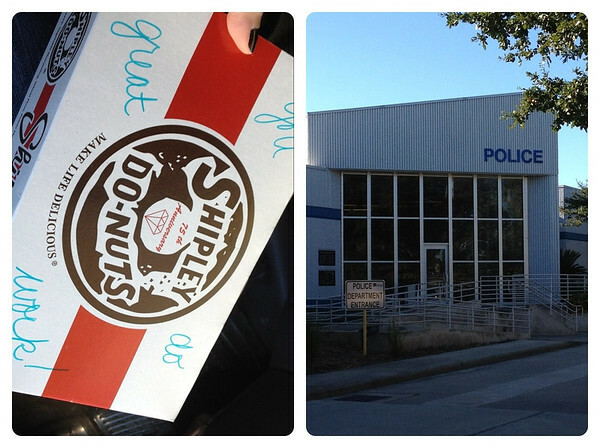 Dropped off two dozen do-nuts (still piping hot and smelling sooo good) to our local police station (this was also a Happy Day Project task). We planned to take one dozen to our fire department and one to the police, but the fire station didn't answer their doorbell so the police ended up with both. 16. 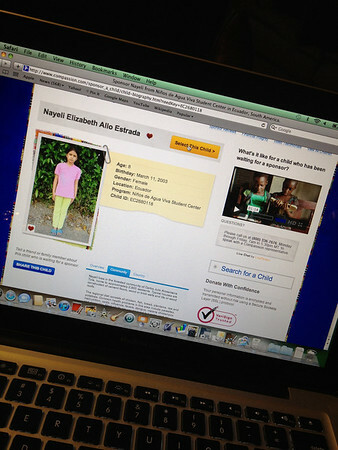 Became sponsors for Nayeli, an 8 year old girl living in Ecuador, through Compassion International. This is something we've talked about doing for the last year or more and just never did it (ugh! ), but finally sat down together and Annelise played a large role in the decision process. It was hard to still see so many faces of children that need sponsors and wish we could sponsor several more. We'll see. Maybe we can. 17. Held the door for an elderly lady at the post office who was walking with a cane. 18. Annelise put quarters in the candy machines at Dollar Tree. 19. 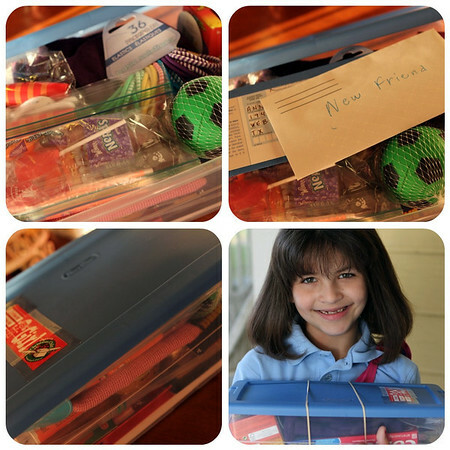 Packed a shoebox for Samaritan's Purse & Operation Christmas Child and Annelise took it to school (this is something her school does every year, love that). 20. Checked her class shoebox donations for her teacher by making sure each had shipping $, appropriate items and were evenly filled. 21. 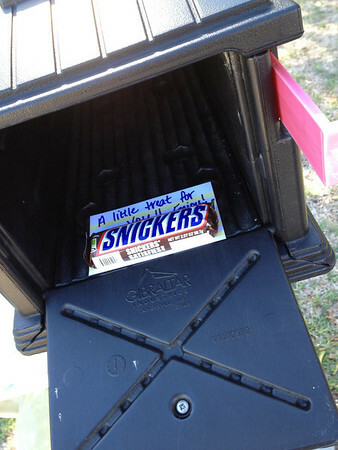 Left a Snickers bar in our mailbox with a note for our mail person. 22. Paid for the lady's order (got off easy, she just had a large Diet Coke) behind me in the McDonald's drive-thru when I stopped for my morning coffee (cream no sugar). 23. Baked pumpkin bars for the PTF dessert giveaway at Annelise's school. 24. Helped with Annelise's 2nd grade class Thanksgiving party. Yes, I am so counting that. I was sweat.ing. 25. 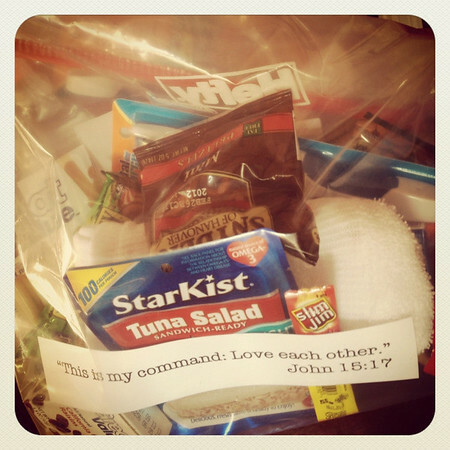 Assembled blessing bags with my bestest girlfriends. 26. 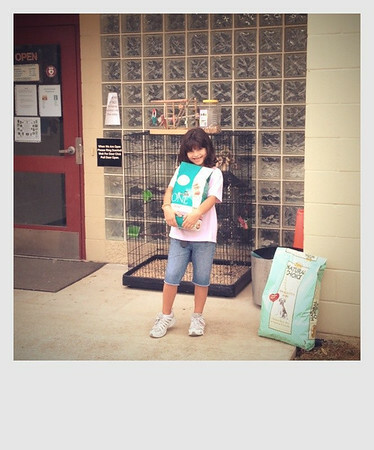 Took dog and cat food to a local animal shelter. 27. 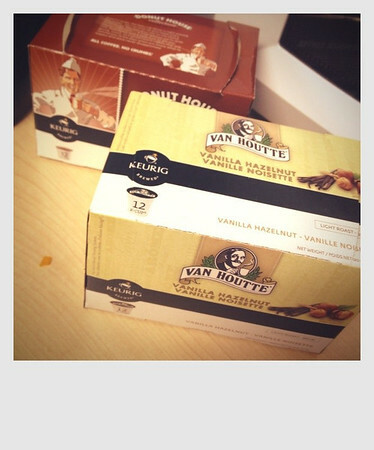 Left two boxes of K-cups in the teacher workroom at Annelise's school. In all honesty, they were not my favorite flavors, so I was happy to pass them along and maybe someone else will like them. 28. Offered to take a couple's photo at the Grassy Knoll during my birthday extravaganza. 29. Put extra coins in the meter in front of the Texas Theater (also part of my birthday stalking). 30. Held the bathroom door for a mom wrangling with a stroller and three children at The American Girl store (birthday trip again). 31. Scott and Annelise dropped change into the Salvation Army bucket while shopping at Fry's. And then I sort of fizzled out. With only 12 more acts of kindness to go. And here's where I stomp my feet and pout and whine a little and feel like a failure for not finishing my acts of kindness by my birthday. And then for not finishing them before the end of November. And then considered completely giving up, throwing in the towel, dropping the ball, waving the white flag, insert your favorite fizzle out metaphor here, and just slip myself on into some comfy sackcloth and ashes. I even dragged my feet on posting this recap-failure update because, well, it's not so cheery to talk about fizzling out--on an act of kindness challenge of all things. But then I changed my mind. So I didn't complete 43 acts of kindness by my 43rd birthday (or even by the end of November). As the prolific singer Pink says, "So What?" And I will finish. I WILL. Eventually. But I would LOVE to hear about your acts of kindness!! Whether you did one or ten or fifty, whether they were simple or elaborate, whether they cost money or were free, I'm sure they were fabulous. I'd love to hear how you felt afterwards (or during) too. You can share your experiences in the comments, through email or if you want to write a post at your own blog feel free to leave a link in the comments so we can find you. I can't wait to hear what y'all have been up to! Plus I may need to borrow shamelessly steal some of your ideas so I can finish my 12. I gave a bag of snack size Snickers to our 3 garbage men yesterday and they seemed so happy! We always give a tip or small gift card to Wal-Mart etc for the holidays and sometimes hand out water bottles to them but yesterday was the 1st time it occured to me to give them a snack (leftover Halloween candy). Duh! These are all great ideas. Isn't it amazing how much people appreciate even small things like you holding the door open? As a mom of 3 who pushes a stroller it does totally make my day when someone takes the time to hold the door open or tries to entertain my kids in line at the post office. These are fantastic acts of kindness! I love the variety of them especially. You've got my mind spinning because I love stuff like this and want to be like this. I am a gold medal door holder and shopping cart returner for sure, but some of the other areas need work. Someone gave me a bag of peanut M&Ms today out of the blue and it brought tears to my eyes! a fellow customer took my tray to the trash at chick-fil-A the other day since I was holding Meredith and Mackenzie didn't want to sit at the table alone. I thought it was super nice! I think some of my favorite things to do were those that were just plain nice--and free--holding doors, picking something up for someone that dropped it, carrying something for someone with their hands full, etc. I think the most important thing is being more aware of others around you and then saying/doing something right then. We need to leave a little treat for our garbage collectors--that's a great idea! I did the cart thing too. I paid for my friend's daughter's contribution to the soccer coach gift (my goddaughter, parents are divorced). I was all set to babysit my nephews this week while my BIL went to a meeting (he stays home and is a counselor in the evenings) even though I really didn't want to, and then they got sick so I didn't end up doing it. But I was going to! Chipped in for a carseat for a family from the Salvation Army Angel Tree (college girlfriends all chipped in for the gifts). I'd like to think I'm fairly kind and willing to do things as they come up, but it was good for me to seek opportunities to do more. And I know you'll finish. way to go! these are such great ideas! and I know you will finish those last 12. no failure in what all you have done! This has been one of my favorite blogs to check during November because of all these fabulous random acts of kindness. No doubt you'll finish and you've inspired all of us to be a little bit better too.